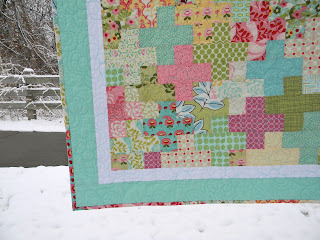 When I took photos of this quilt top a month and half ago in the snow, I was wishing for spring. We're closer to the official start date of spring, but here I am again snapping pictures in the snow! I decided to add a couple of borders. 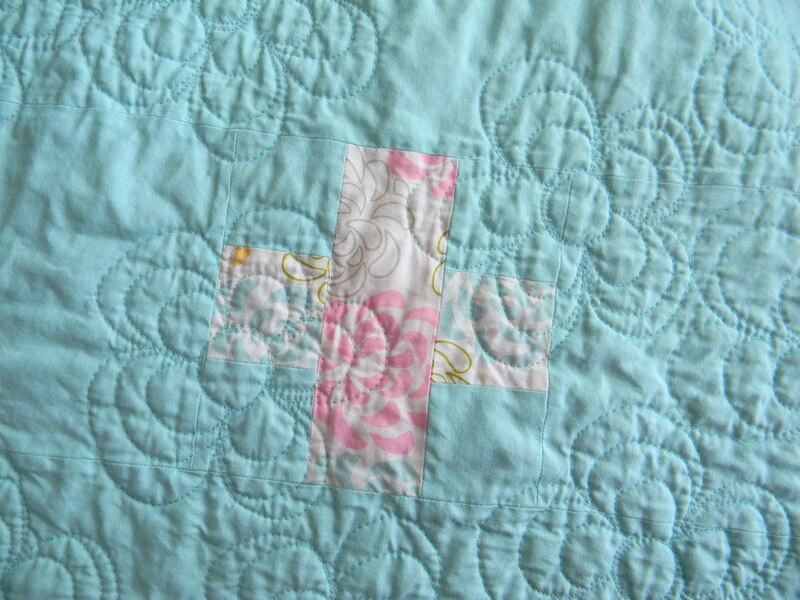 They are certainly nothing innovative, but the solids aqua did allow me to show of a pieced border that might have been lost against the plus blocks. 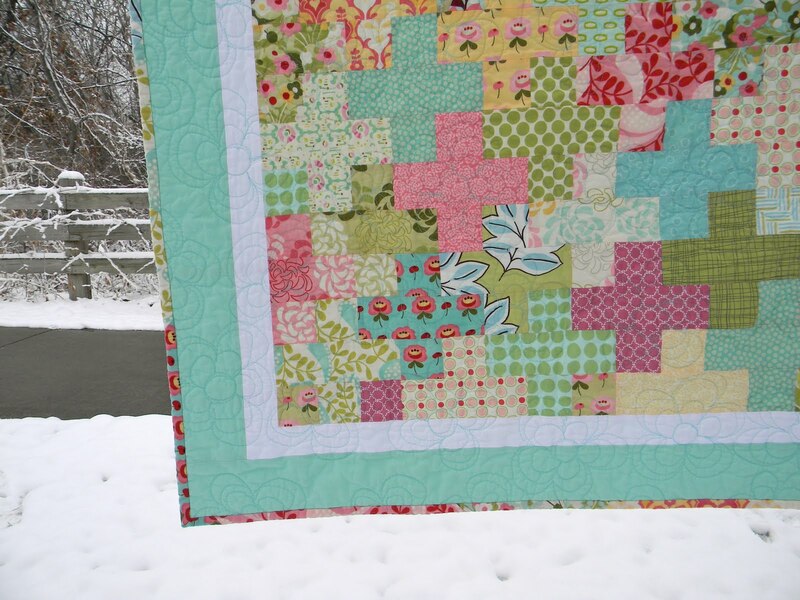 The borders also made my quilt closer the size I like for babies. It is 41" x 41" after being washed. Just right! 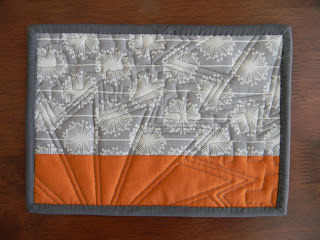 I got all cocky after free motion quilting my last quilt, so I decided to try another pattern on this one. 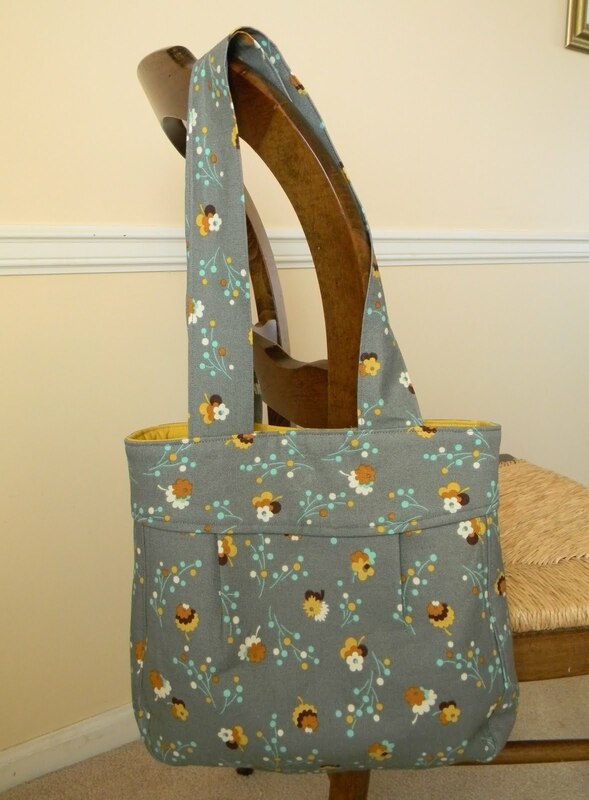 I used the tutorial by Elizabeth Hartman to make this all over floral pattern. The flowers were really fun to do. 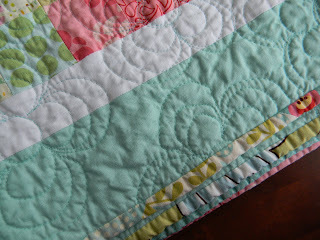 I used a Moda Bella solids aqua for the outer border and back. While I love my Konas, the Moda Bellas do have a lovely, soft hand that the Konas lack. I added a single plus sign to the back for fun. This quilt is now on its way to its new home in Australia. How is it that the right mix of solids can make a traditional block look so modern? 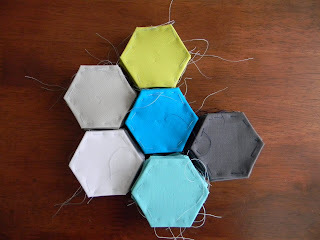 The magic of solids meets hexagons. 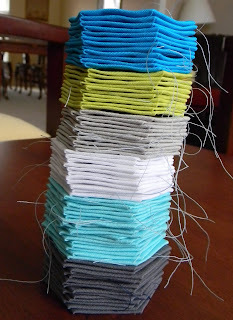 These are Kona solids in lagoon, cactus, ash, white, azure, and coal. 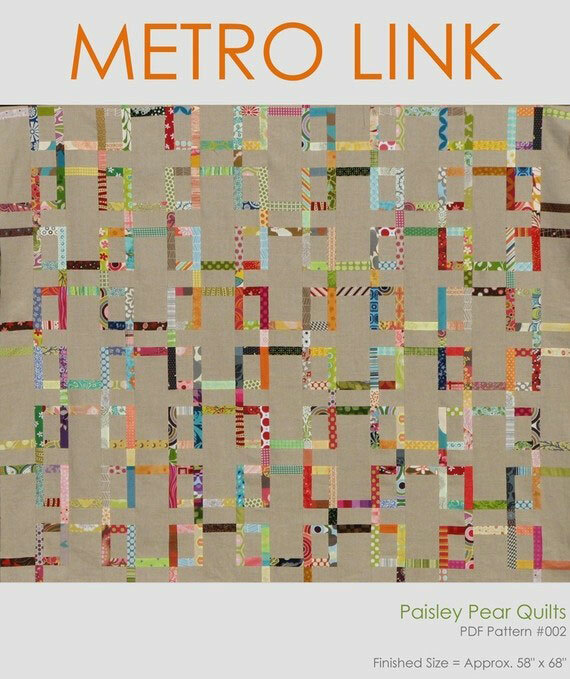 I love a good geometric basic, and Metro Living circles are perfect. And Heath by Alexander Henry will be really versatile. 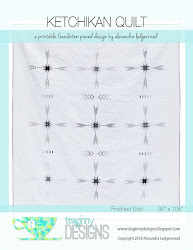 While I was finding these great basics, I saw this pattern by Paisley Pear Quilts at Pink Chalk. Must make it immediately! Isn't it awesome? 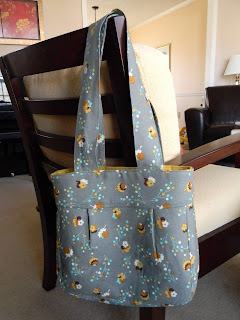 I finally made my first handbag. 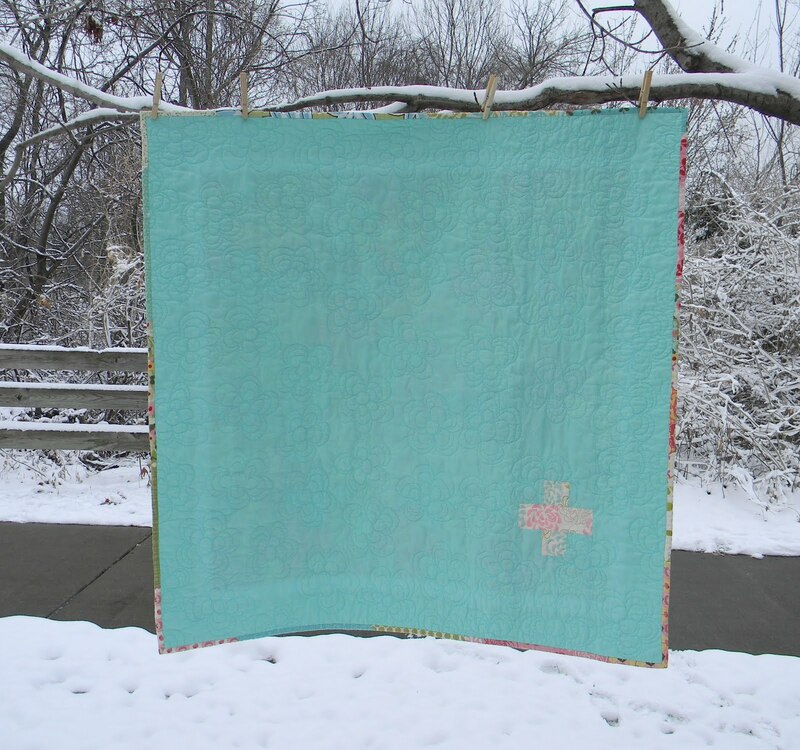 This is made from Denyse Schmidt's County Fair home dec weight fabric, lined with Kona in Curry, using the Folklore pattern from One Yard Wonders. I wish I'd googled the title of the pattern before making it. The wisdom of the internet would have warned me that there are multiple errors in the patterns in this book. Oh well, I was able to fix them, but if you like the style of this bag you should know a few things. First, the pattern piece for the lining is too small. 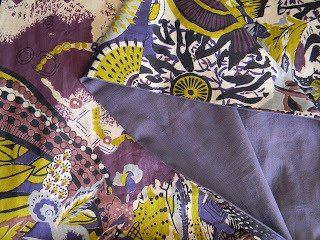 I adjusted for this by using narrower seam allowances when making the lining. The markings for the pleats are not wide enough on the outside of the bag. That's easy to fix. Even though it doesn't tell you to, be sure to interface the straps. 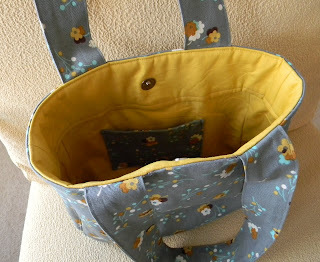 Fusible fleece will give the bag a better shape than interfacing. And finally, the construction of the bag is a little odd. 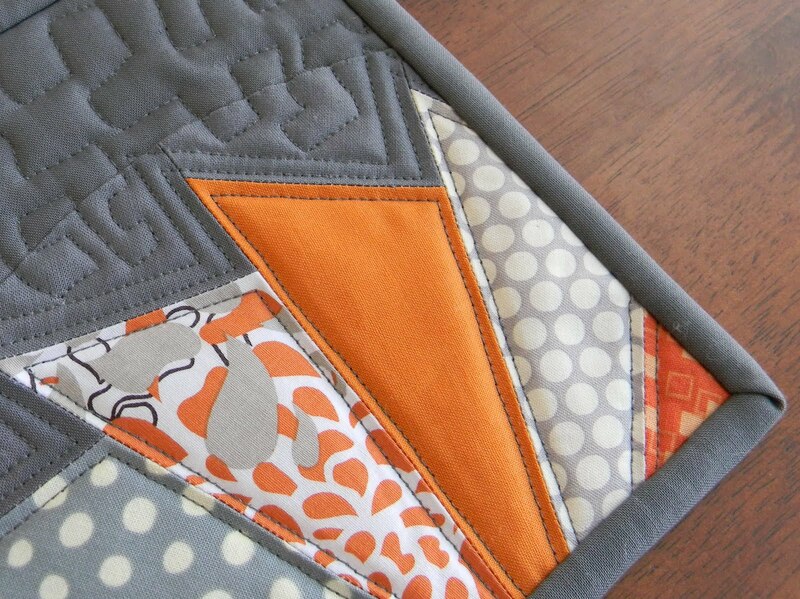 Instead of sewing right sides together, in a few places it has you iron under the seam allowance and then top stitch it to another piece. I guess whatever works. In the end, I'm glad to have finally tackled making a handbag (with a magnetic closure - which, by the way, is easy peasy to put in). It was kind of fun. 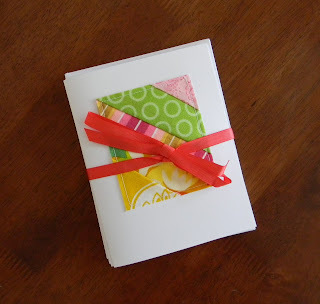 I made a slew of these for gifts at Christmas, and they were really well received. In fact, someone requested I make some for my shop. So, I pulled out my scrap bins and had lots of fun playing with color and fabric combinations. 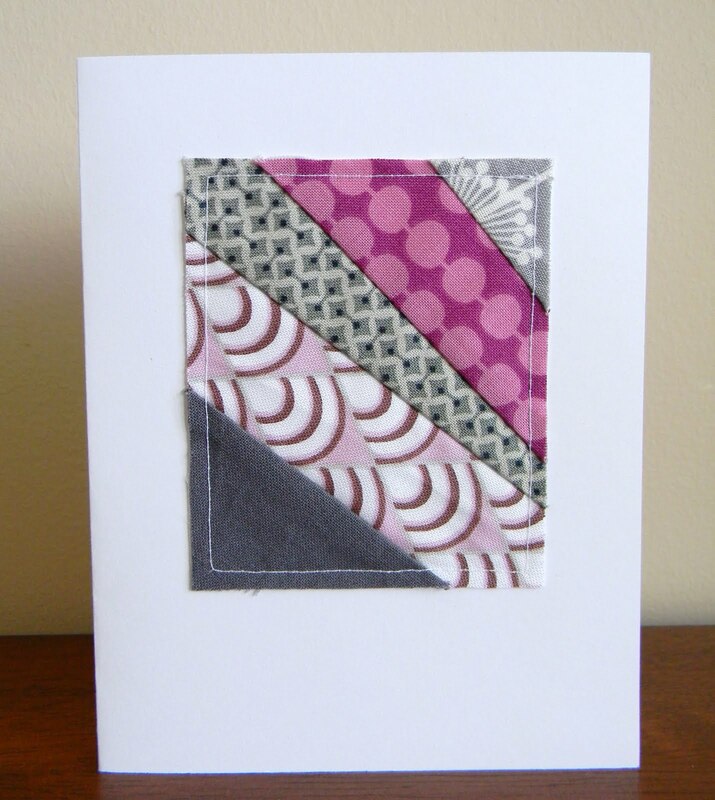 I may or may not have made a ridiculous number of these modern patchwork note cards. 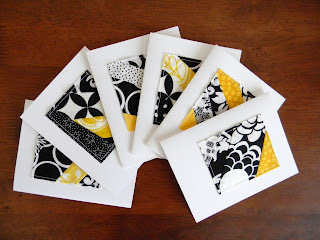 I've listed them by color in sets of six. Even more to finish and list soon. 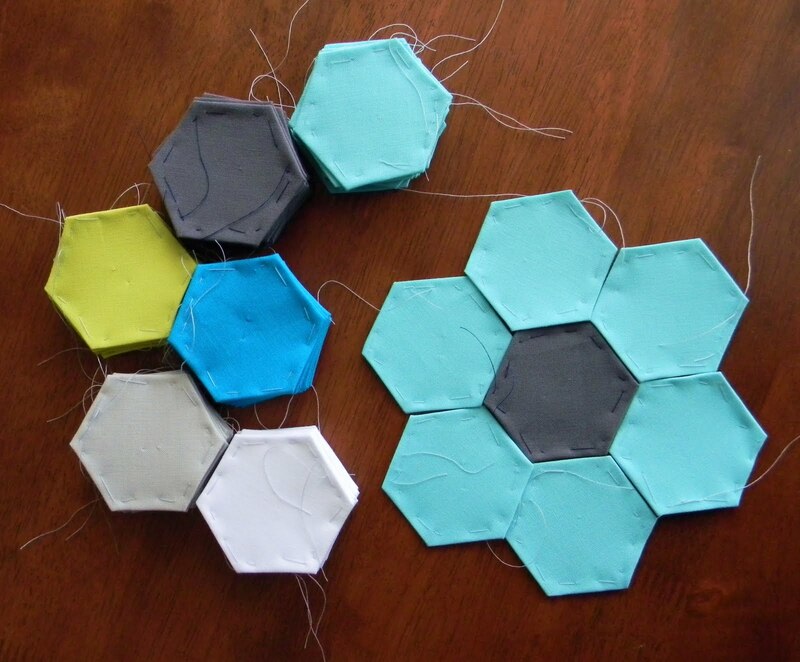 I linked to a tutorial before by PioneerValleyGirl, although this time I developed my own technique for making them. 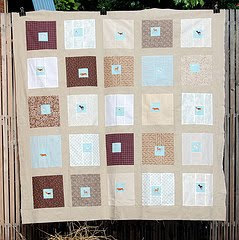 Foundation piecing each rectangle on muslin allowed me the control I wanted. 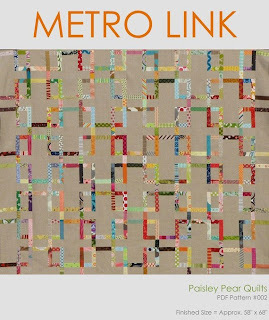 Last night was another fabulous meeting of the Kansas City Modern Quilt Guild. We had a fun guest speaker, Alissa. She is one of the founders of the first Modern Quilt Guild in LA. 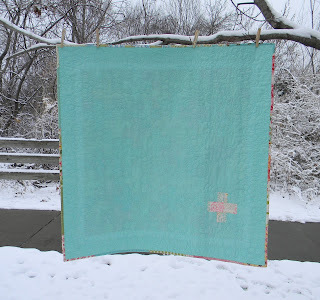 She showed us some of her quilts and talked about the new minimal style she's pursuing. 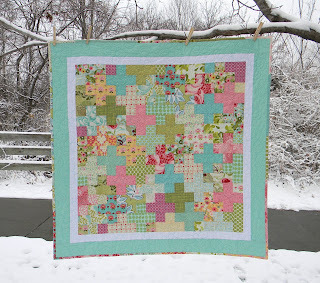 Hop on over to her blog to see some of her fabulous quilts. We decided to start a new charity project as a guild too. 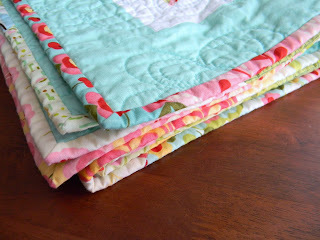 Our quilts for the NICU was a huge success, and I hope this new project will be too. We're going to be making, excuse the cold clinical term, fetal demise pouches. 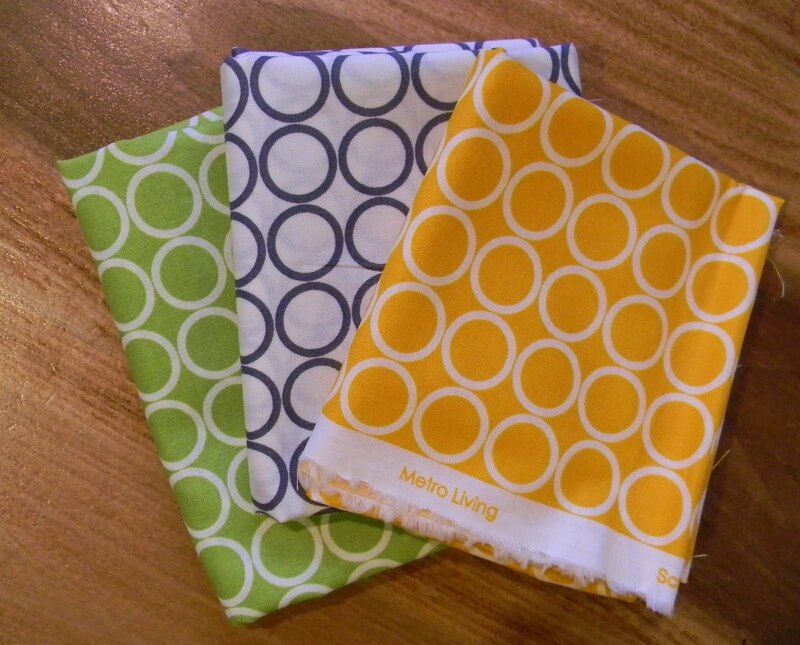 These are for babies who don't survive and are so tiny there is nothing small enough to put them in. Andrea, a nursing student, saw the pouches the hospital currently has and thought we could make something nicer. After all, babies are photographed, presented to their parents, and sometimes even buried in these pouches. 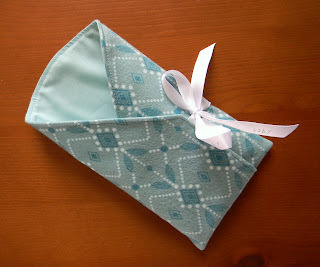 Nothing is really special enough for that, but I tried to create what I would want to have, when I designed this pouch. I used the softest material (Anna Maria Horner voile and flannel) and a wrap style to cradle the little body. I'm putting a link here to the tutorial pdf. 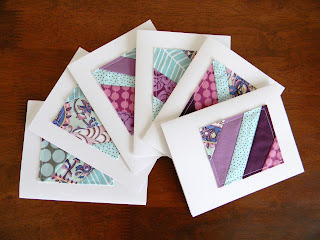 If you have a desire to make these to donate to your local hospital, you are more than welcome to use this pattern. Different hospitals will have different preferences and regulations, so you'll want to get an example approved before making more. 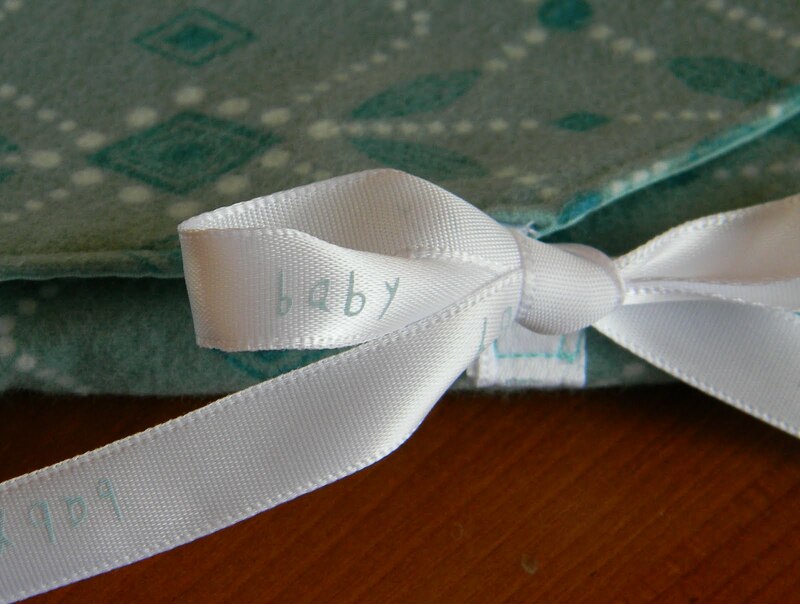 I'll warn you that making a pouch can be hard, emotionally, but imagine what it will mean to parents. I was finally able to use some of my lovely fabric from India, which feels similar to voile, and a piece of gorgeous shot cotton to make this infinity scarf. It is one large circle, and you can wear it looped twice or in other various other configurations. 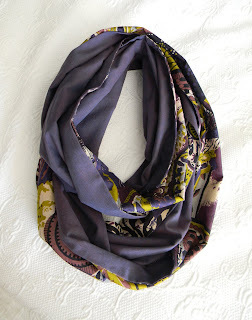 I learned the hard way why I think it is called the infinity scarf. If you are overly confident and think you can figure out the construction of such a simple shape on your own, you'll likely end up, as I did, with a long tube you try to turn right side out, only to have it turn in on itself continually. Or infinitely in fact. 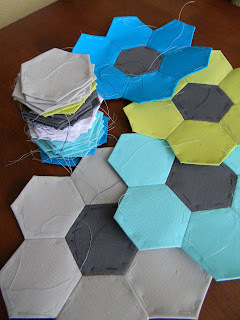 Just read the tutorial on Anna Maria Horner's blog first and save yourself the frustration. 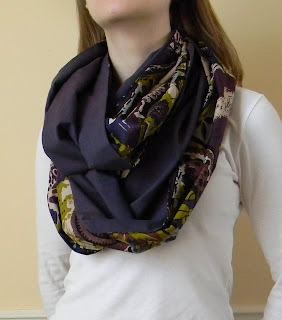 She calls it the figure eight scarf, and she has some kits for it using her yummy new velveteen. It's so nice to have a real blog banner. Thanks to the multi-talented Aunt June for the new designs! I'm going to have my very own business cards soon. 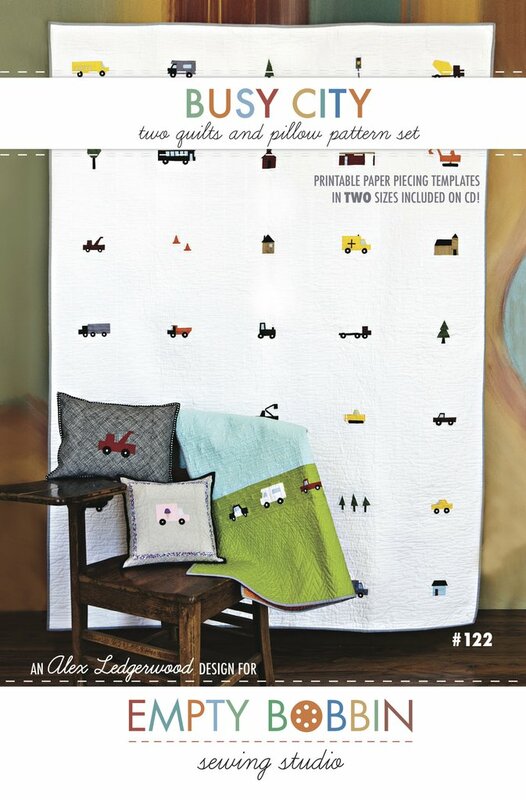 And this quilt top made me smile. It is Bellgirl's lovely (and big!) version of my Out for a Walk pattern. Isn't it lovely? 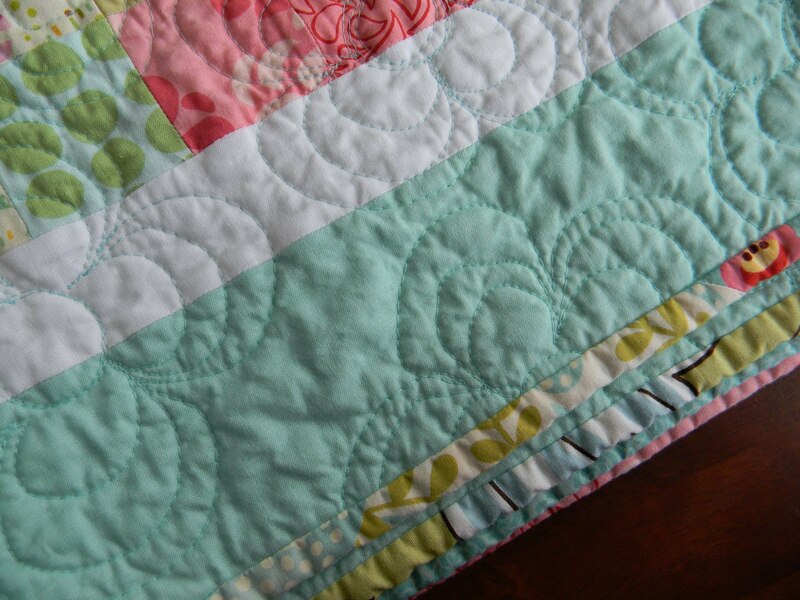 I love the sashing color. You can read more about it here on her blog. Thanks for sharing Annabel! A mug rug for my dad. He'll use it everyday to set his coffee cup on, and it'll keep the granite counters from draining all the heat away. Just a small reminder of me. 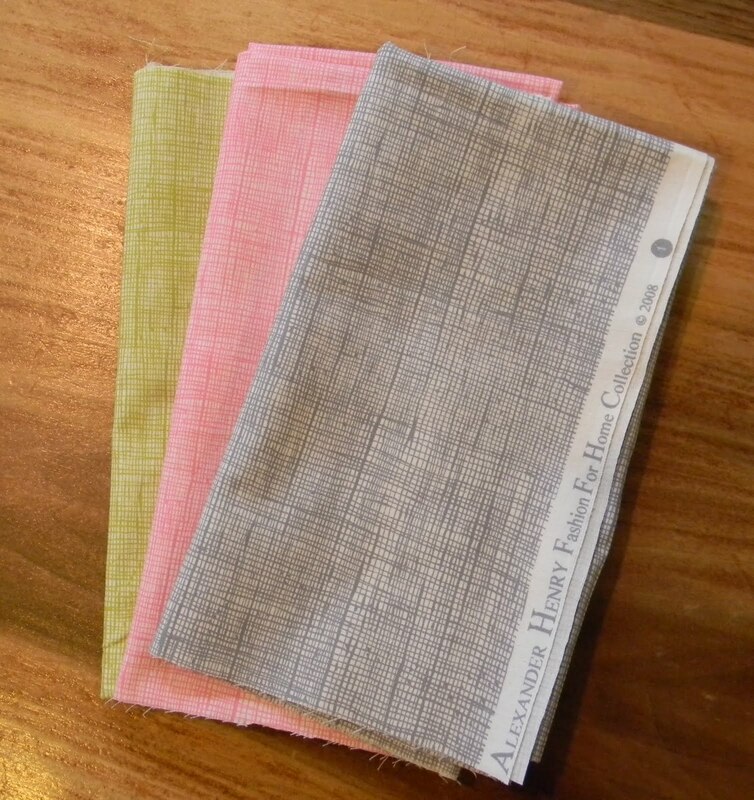 I feel drawn to small projects after the completion of a long term project, for the instant gratification sure, but also for the freedom they offer. 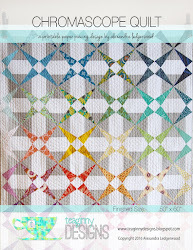 You can play with new ideas, color combos, etc without the commitment of a whole quilt. 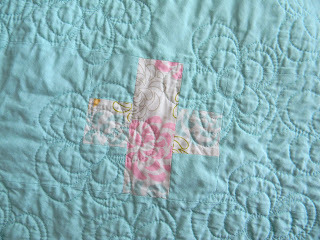 I played around with a technique from Jacquie's amazing Broken Cogs quilt. I also got to try out my new dresden wedge ruler. This is an edgy spin on the dresden, and more masculine, I think. 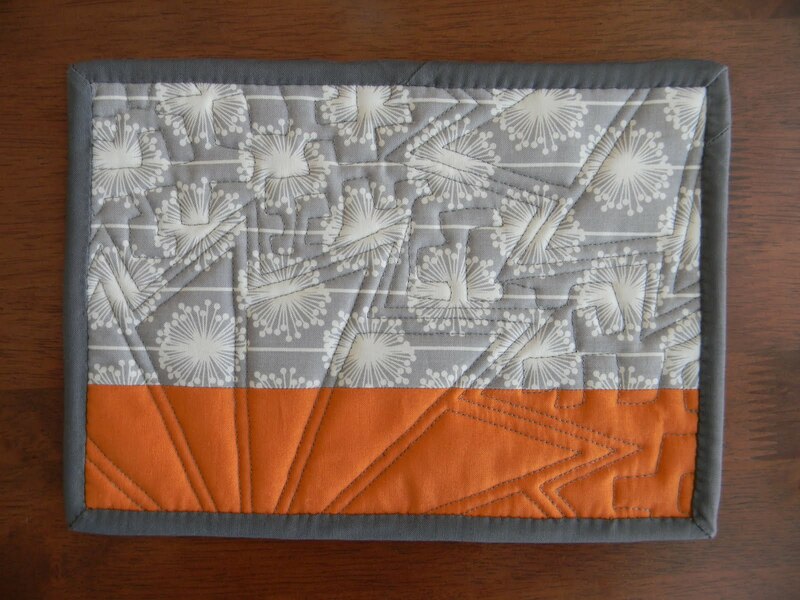 I also got to use orange and gray. Does any color not look fantastic with gray!? 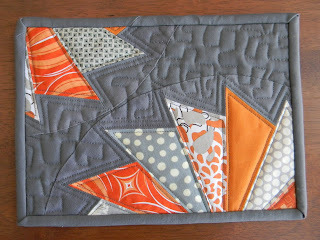 And finally I got to try some squarish meandering quilting. Phew, it's a little tricky, but fun. I love small things when they're like this. Another quick project (if you, unlike me, are actually a good knitter - mine took three tries and over a week) is a preemie baby hat. Save the Children is hosting a big drive for them now. 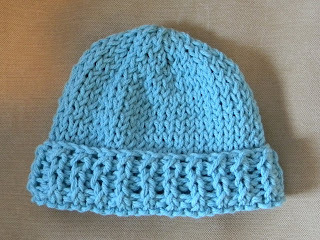 Hats are due by the end of the month and go to newborn babies in developing countries. I'm hoping to have a couple more done to add to the pile being donated by a local knitting group. See this site for more info. FYI these are always appreciated by the NICU at your local hospital too.